Gotten Three so far while trying for Crumblewidget's. Dropped from "a workshop repairer" in instance #1. The randoms are supposed to drop from all mobs. Anyway, took 508 kills in the zone which seems like a lot less than what magelo lists http://eq.magelo.com/item/101368. i.e. 0.03% - 0.02% chance to drop. This took 9 hours with a well geared 85 ranger + cleric merc + buffs galore from guild hall. Now for the memorable part of my story: I was about to camp for the night so I /taskq and decided to try to kill one more mob before the task booted me. I though to myself what if it has my item and I don't kill it in time (you know the kind of mind games that keep us all stuck playing longer than we should like some degenerate gamblers). It dies, I bend over to loot and *bingo*. I got booted 8 seconds after looting. I couldn't believe my luck. Of course the next time I'll just keep saying "just one more mob". Dropped off a a lab attendant. The metal robot kind. Edited to correct, I think it was more like 120 hours, vs. 160. 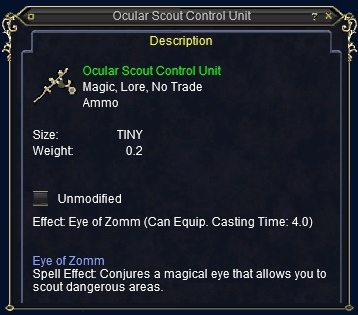 I discovered this item about 3 months ago and spent a good 85 hours there, at first. I figured it couldn't be THAT rare. Boy, was I wrong. Let's just say, if I wasn't raiding, I was pretty much doing this task, and taking a break from time to time, because, hey, it's kind of boring killing mobs in a circular room for hours upon hours. If you figure about 5 hours a day, you can see, I was at it quite a while. I gave it the old college try a few more times, and it finally dropped. I remember remarking to a guild mate (who came to exp with me and maybe get that awesome over charged faycite aug, which he did, actually) that at the time he'd joined me, I'd been doing this task for about 105 hours. SO, yeah. I'd say about 120 hours, total time. Just had to meet the right mob and the RNG was kind. Incidently, there are sentries that come down the ramp and attack you from time to time (If you are by the ramp, duh). They don't wander the room, and if there's nothing at the base of the ramp, they just walk back up again. If you are attacked, though - or if you attack them - these sentries sometimes seem to "call" their friends. I've had 1 of them, then suddenly, had 3 more sentries run down the ramp to help out their pal. They have a really neat trick, too. They gank your pet. They don't charm it, because it doesn't attack you. It doesn't do "anything" at all. It does show up on the extended target window as an "enemy", but once the sentry dies, your pet just poofs. Your mage geared, haste masked, kick *** pet... just poofs. I finally gave up gearing them. I'd lose about 1 pet a session or so due to this bug/feature. I eventually learned just to not fight anything by the ramp, if I could help it. After a while, you can get the spawn timer down, and pretty much go 'round and 'round and pick 'em off. My suggestion, if you are a pet class is to stay away from that ramp and don't bother with the sentries. I boxed this with my chanter and two healer mercs. The sentries ganked chanter pets and necro pets, indiscriminately. They never did gank a a charm pet. I didn't charm much tho, kind of a hassle really, having to watch it all the time. The minotaur is the money charm (he self hastes), followed by the robot mobs. The gnomes are weak sauce. I'd burn 2 - 3 gnomes at a time. finally got mine after about 15 hours in the first S.H.I.P. instance, Deception and Interception. i stayed on the first floor near the elevator clearing out the big circular room. "a lab worker" dropped mine, your standard male plated gnome. just to give you an idea of how many i killed, my warrior bot went from 75 to 78 during my mass slaughter-fest. S.H.I.P. #1: Deception and Interception Trash Drop.